Episode three opens with a close-up of Barb's face, wet and bloodied. She is laying down. One lens on her glasses is broken, and she coughs up a slimy liquid. She looks around, discovering a strange place with some kind of chaff constantly blowing. She calls out for Nancy. Instead, she sees the monster we finally got a look at last episode and screams. The scene cuts to Steve and Nancy making out on his bed. Ew. And so we begin a montage of Barb trying to escape the monster while trapped in an empty and shadowy version of the pool she was sitting at the last episode and Steve and Nancy getting a little too friendly, with a quick cut of the normal glowing pool thrown in for good measure. Barb finds the pool ladder and climbs up, only to be dragged down again. After the opening titles, Nancy leaves Steve sleeping, pausing by the pool when she hears a noise, then heading home. There she is confronted by Karen, who isn't totally clueless about her daughter's real reasons for being out too late. Still, Nancy insists that "nothing happened." At the Byers home, Jonathan wakes up to find his mom talking to the lights. He chalks it up to her being crazy with worry and tries to get her to calm down. Eleven plays with a handheld radio while the boys plot their search for Will. Dustin and Lucas argue over the scope of Eleven's powers, and Dustin tries to get her to use her mind to make a model of the Millenium Falcon fly. She gives him a "you're stupid" look, and as the boys head off to school, Mike tells her to meet them outside at 3:15. Meanwhile, at the high school, Nancy is feeling very self-conscious after her evening with Steve. Speaking of Steve, he meets her at her locker, unfazed. Steve insists he didn't tell anyone and they kiss. Gotta say, it's nice that Steve didn't do the classic jerk move and dump Nancy after sleeping with her. Nancy also notices Barb is not at school. Suspicious. Hopper and his men arrive at Hawkin's lab where the convince the security guard to see if he can get them a way in. Back at the empty Wheeler household, Eleven uses her mind to make the Millenium Falcon fly. AWESOME. She explores the upstairs, and when she turns the TV on, a Coca-Cola commercial gives her a flashback to being in the lab where Dr. Brenner made her crush cans with her mind. Joyce hangs up lights. Then she buys a ton more + a phone. Her plan to communicate with Will is in action. Hopper and friends search a tunnel connected to the Hawkin's Lab. Hopper notices a camera and asks to check into previous recordings. He watches the recordings from when Will disappeared, but there is no sign of the boy. As he leaves with his officers, he notes that it was raining that night and there was no rain on the tape, revealing that the people at the lab weren't telling the truth. Then we get a lovely view of the expanding creepy slime from the first episode. Okay, then. Eleven ventures upstairs, checking out Nancy's room in wonder. She is first captivated by a music box, which seems to pull some powerful sad emotions from her. Then she notices a board of Nancy's photos. She zeroes in on one of Barb and Nancy. Lunchtime at the high school: Nancy asks if Carol or Tommy (Steve's annoying friends) if they know what happened to Barb. They segue the conversation into an awkward reference to last night's events (thanks a lot). Nancy notices Jonathan Byers in the hall. The boys search for rocks for their slingshot. Lucas teases Mike about his obvious, adorable attraction to Eleven. Unfortunately, the bullies show up and joke about what happened to Will. Before leaving, they trip Mike, causing him to cut his chin on a rock, which our boys decide is the one for the job. Jonathan develops his photos in the school dark room, including the ones of Nancy through the window. Come on, Jonathan, you're better than this. Some random girl walks in, glimpses the photos, and Jonathan quickly leaves. Way to be cool, bro. At the Byers house, Joyce surveys the hundreds of lights she's strung up. Someone knocks. Oh, it's Karen Wheeler, and she has casserole! She also brought her toddler, Holly. Hopper and one of his cops heads to the library to do some sleuthing. Aside from running across the lady he was with last episode, Hopper finds some interesting info on Hawkin's Lab and a study they did years before that caused a lot of trouble, with one participant claiming that they kidnapped her daughter. Hmmmm. Back to the Byers. Joyce explains away her lights with the fact that Will loved Christmas. While the adults are talking, Holly notices a trail of bulbs light up in the hallway. 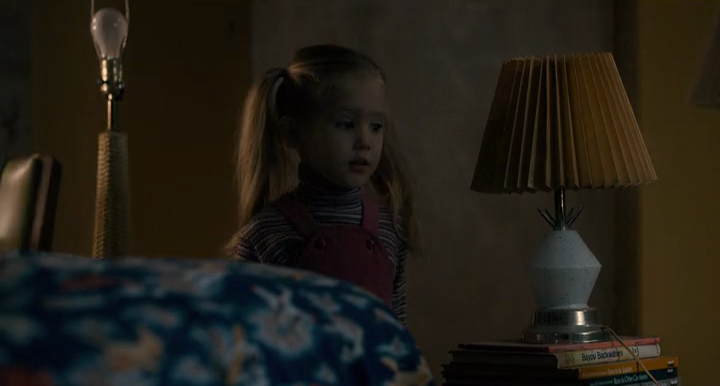 She follows them to Will's bedroom, where the community of lamps Joyce set up start flickering. This is getting creepy, especially since the episode is titled Holly, Jolly and that is the toddler's name. The lights suddenly go out (OH NO). Quick shot of Joyce and Karen in the kitchen, then back to Holly. She's staring at the WALL. Something starts to press through it. Thankfully, Joyce grabs her before the monster can. Phew. She asks them to leave. Nancy calls Barb's mom, who has no idea where her daughter is and doesn't seem too concerned. She asks Nancy to call when she talks to Barb. Steve and company confront Jonathan about his photos. Steve takes special umbrage to the photos of Nancy. When Nancy arrives, Carol shows her the photo. Steve calls Jonathan a pervert, rips his photos, and breaks his camera. Steve and company walk off, but Barb pauses when she recognizes Barb sitting by the pool. She grabs some pieces as Steve calls her away. Eleven waits by the power pole at 3:15. A cat hisses at her, and she flashes back to the lab again where the Brenner tried to make her do something to a cat, I assume kill it. She refuses and is taken to the small room we see her locked in the first episode. This time, she stops the two guards, killing them (or injuring them very badly, ahem) with her mind. The doctor comes in and caresses her. She starts crying, and he picks her up. Oh, and he calls her incredible. Okay, then. He carries her down the hall, past the slain guards as she lays immobile in his arms. The boys pick up El and she rides on the back of Mike's bike, taking us back to E.T. Nancy finds Barb's car on the road. She goes to the pool, calling for Barb. She walks into the woods and hears something. Something flashes across the screen. Nancy is just as freaked out as we are and runs away. Good call, Nancy. At the Byers house, a trail of lights appear. Joyce follows it into the living room and a cupboard there. 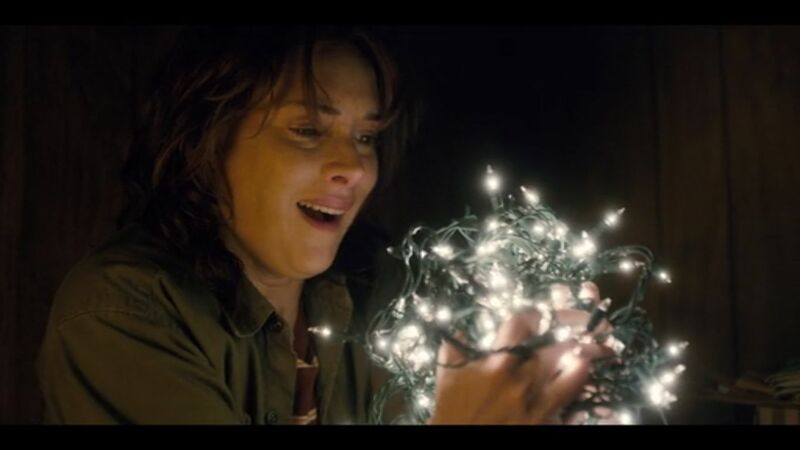 She grabs a huge wad of lights and climbs into the cupboard, asking if Will is there. The lights glow in response, so she sets up a way to contact him with yes and no answers based on how many times the lights glow. Will confirms that he is alive, but replies with two flashes equaling no when asked if he is safe. Joyce tries to ask him where he is, but of course he can't answer that in yes or no questions so she paints letters over strings of lights on the wall, one for each letter of the alphabet. Nancy arrives home, confessing her fear over Barb's safety to her mom. We finally get back to Hopper and his fellow cop in the library. Fellow cop is a skeptic. I wonder if he's related to Lucas. He doesn't believe the LSD mind control story that one of the reports talked about. Hopper points out that Martin Brenner was involved in the tests of the pasts and is the doctor in charge of Hawkin's Lab. Hopper theorizes that Will saw something he shouldn't have and that's why he's disappeared. The third cop calls in, asking for the chief. In the next scene, they're running out to the car. They drive off with sirens flashing. El leads the boys to Will's house, saying that he's hiding there. The boy's (mostly Lucas) get upset at El for taking them where Will obviously shouldn't be. Their discussion is interrupted when they see the police and an ambulance go by, their thoughts immediately going to Will. They speed after them on their bikes. Joyce finishes her wall painting and asks Will to tell her where he is. He replies, "right here." She's understandably confused and starts asking him what to do. He signs out three letters. The lights go crazy in the room and the monster pushes through the wall. AHHH! Joyce runs away (obvs). The boys follow the emergency vehicles to the lake/quarry I think we saw earlier in the series. We also see Hopper rush out of his cruiser, hoping that whatever they found is not "the kid." The kids huddle at the end of an ambulance where they watch as Will's body is pulled from the waves (NOOOOOO). Mike insists that it can't be Will, but Lucas says it is. El tries to comfort Mike, but he reacts in anger, thinking that she lied to him about finding Will. He rides off on his bike while his friends ride after him. Joyce runs down the road, almost running into Jonathan's car. He gets out to see what's wrong, hugging her. Mike rushes into his home (where Nancy and her mom seem to be meeting with Barb's parents) and falls into his mom's arms, crying. Joyce and Jonathan hug as lights flash in the distance, approaching. In Memoriam: Random guards, Mike. Unknown: Barb. I almost put her in the "In Memoriam" but we haven't seen her corpse, so. Wow! That episode was a killer. What did you think of the ending reveal when you saw this?